Check out this Organic Sencha Green. 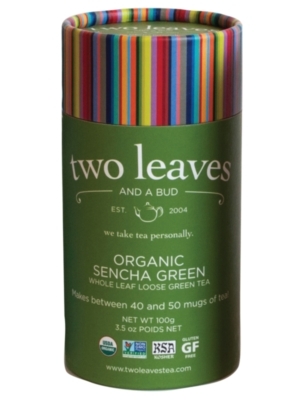 The Organic Sencha Green Tea from Two Leaves Tea offers the flavor of traditional roasted whole leaves and steamed green tea! Packing an energy boost that�s suitable for a busy and active lifestyle, each cup of tea will recharge your batteries within minutes, while delighting your taste buds! The cylinder packs 100g/3.5oz whole loose green tea leaves, offering between 40 and 50 cups of tea! The slightly sweet flavor lingers on after each sip, offering a long-lasting fresh flavor!